In the heart of the Indian Ocean, the beautiful Four Seasons Resort Mauritius at Anahita welcomes guests to its luxurious tropical sanctuary, where you’ll be warmly greeted by warm smiles and beautiful lagoons. With four swimming pools, you’ll find 123 villas set among islands and inlets, affording privacy and a village atmosphere. Perfect for a gay or lesbian honeymoon in Mauritius, the property is designed immaculately and boasts open-sided pavilions with thatched roofs and walls of water. At night the atmosphere is augmented by a stunning lighting design and the cuisine and dining options are aplenty. Centrally located on a private island and just a stone’s throw from the beach. This spacious and chic villa can fit four people. You’ll be staying right by the sea in this capacious villa. Your private garden and heated plunge pool will give you all the luxury you need. Situated right on the golden sands of Mauritius, this luxury villa is ideal for beach lovers. Just outside your villa steps lead you directly to the blue waters of the lagoon. Every morning you’ll be greeted with panoramic views. 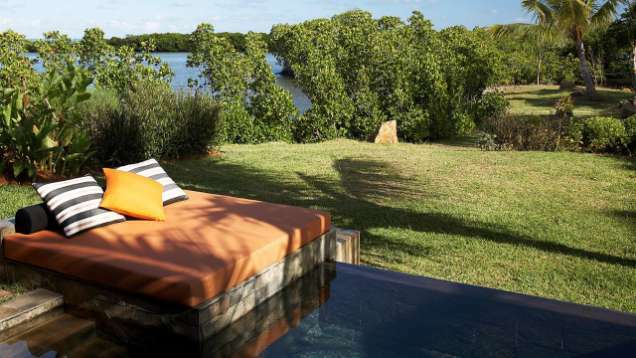 Set among the beautiful mangrove trees, this villa is ideal if you want to be surrounded by rolling greenery. Set in private landscaped gardens, you’ll enjoy some of the best views in Mauritius. Enjoy light sushi or an extensive multi-course meal. What’s more, you’ll be dining under the stars. This beautiful French Restaurant has stunning views of the sea. Dine on a wide range of classics, from lobster to Seared Foie Gras De Souillac. From sushi to pizza, this thatched, beachside restaurant offers a range of different cuisines. Themed nights may be hosted celebrating African food or local cuisine. Somewhat off the beaten track, you’ll find this restaurant just by the 18th hole. Ideal for golfers looking for a chic yet casual dining experience. Non-golfers are more than welcome. Set on wooden pillars above the lagoon, this award-winning spa is surrounded by tropical vegetation. You’ll head the sea lapping around you as you indulge in a number of treatments. Choose from a range of massages, including Sport Massage, Thai Massage and Hot Stone treatments. You can also enjoy facial and many more beauty treatments.